ShopHouse Kitchen is set up very similarly to Chipotle. The customer slides down the counter telling the server how to customize their meal as they go. The first decision is a bowl or a sandwich. The sandwiches are a take on Banh Mi sandwiches and have less customization than the bowls. If you choose a bowl, you then have to choose whether you would like rice or chilled rice noodles; if you choose rice you must decide jasmine rice or brown rice. The next step is the choice of meat: grilled chicken satay, pork and chicken meatballs, grilled steak, or tofu. The next steps in the process make it more complex than Chipotle. You get a choice of vegetable: Chinese broccoli, eggplant and Thai basil, long bean, or spicy roasted corn; you get a choice of topping: roasted garlic, toasted rice, or crushed peanuts; you get a choice of garnish: green papaya slaw, pickles, or herb salad; and finally you get a choice of sauce: spicy red curry, green curry, or tamarind vinagrette. On your first trip you may want to study the menu before you get in line, the choices are more numerous and potentially confusing than your standard Chipotle burrito order that you know by heart. Additionally, because of all of these options, you are much more likely to change up your order on repeat visits whereas most people seem to have one order at Chipotle that they get over and over again. While trying all of the combinations will take some time, we found a combination on our first trip that we greatly enjoyed. Try the jasmine rice bowl with grilled steak, eggplant and Thai basil, crispy garlic, herb salad, and the spicy red curry. The grilled steak itself was very similar to the steak you are used to at Chipotle, tender but flavorful from the grill. However, the similarities end there. The eggplant, the various herbs, and the roasted garlic all combined to add several levels of flavor to the rice and steak. Then the spicy red curry sauce gave the dish a nice and spicy kick towards the end of each bite (although some may find it too spicy). The portion was just right: if you enter hungry, you are unlikely to leave that way, but if you are not starving, you will have a nice meal and then some leftovers to go. almost the exact same even though you are choosing ingredients from an entirely different cuisine. The prices are also similarly reasonable, depending upon your meat choice it will cost you between $7 and $8. The clientele is also similar: young people looking for a quick and cheap meal. The one complaint is the lack of space in this first location. Even though it was not a very busy night for the restaurant, we still almost had to wait for a table because there are so few. 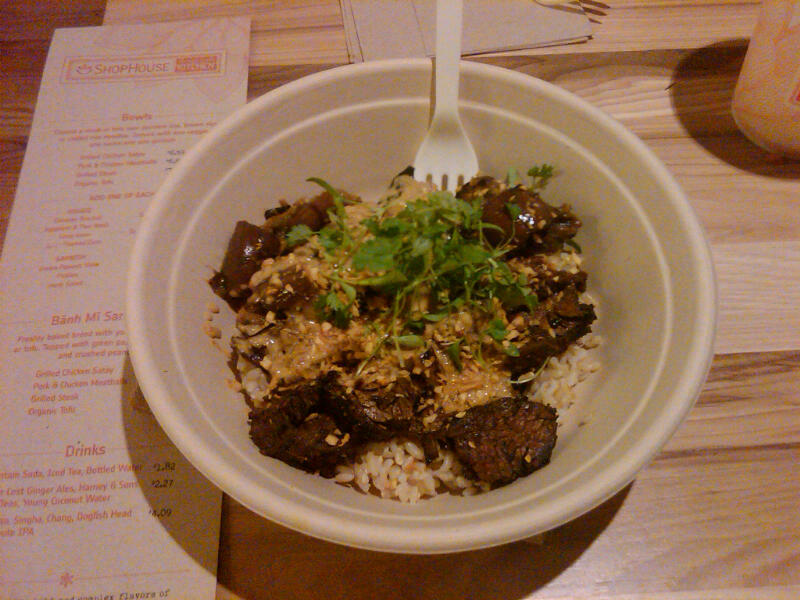 ShopHouse Kitchen is an exciting concept for anyone nationwide who loves Chipotle. The company revolutionized one type of cuisine already and now has the potential to do it again with a very different cuisine (it already has on a small scale). 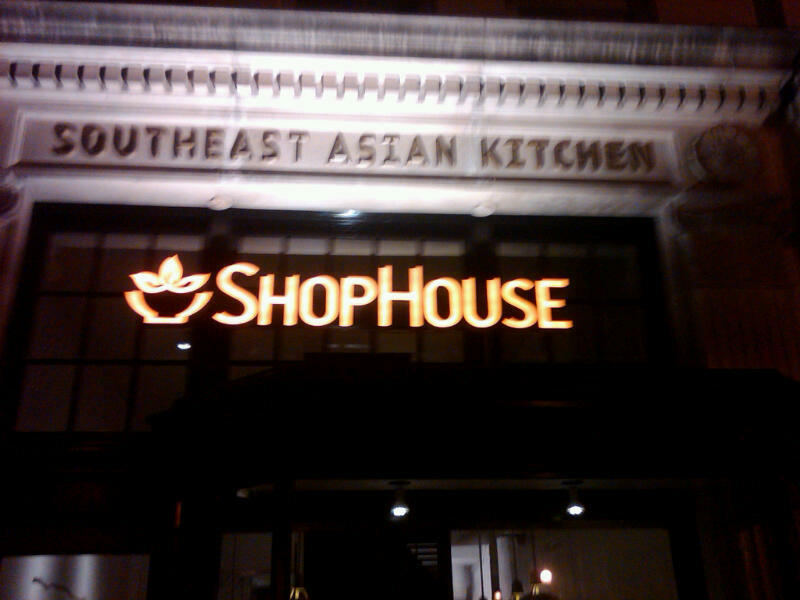 We are excited to see how quickly ShopHouse Kitchen expands in the D.C. area and around the country.